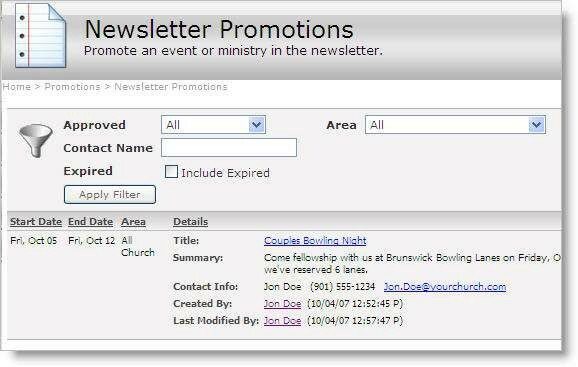 The Newsletter Promotions page is a central page where users manage newsletter requests for a printed newsletter. You can use this page as a quick reference for approval of all Newsletter Requests. Use this page to centralize printed and online newsletter requests. Arena does not publish a printed newsletter rather publishes an online e-newsletter. Use the filters at the top of the page to display the desired items. The columns displayed on this page include Starting and Ending Dates, Area, Details, Approval Status and Priority. Click the Title link to open the entry. Click the Save Changes button to save changes to the Approved or Priority columns.